Seen from the Islay ferry during a crossing to Port Ellen, Lagavulin distillery partly hidden behind the ruins of Dunyvaig Castle and the coastal rocks. Taken from the hills behind Kilbride Farm, a view of Lagavulin on the south coast of Islay. 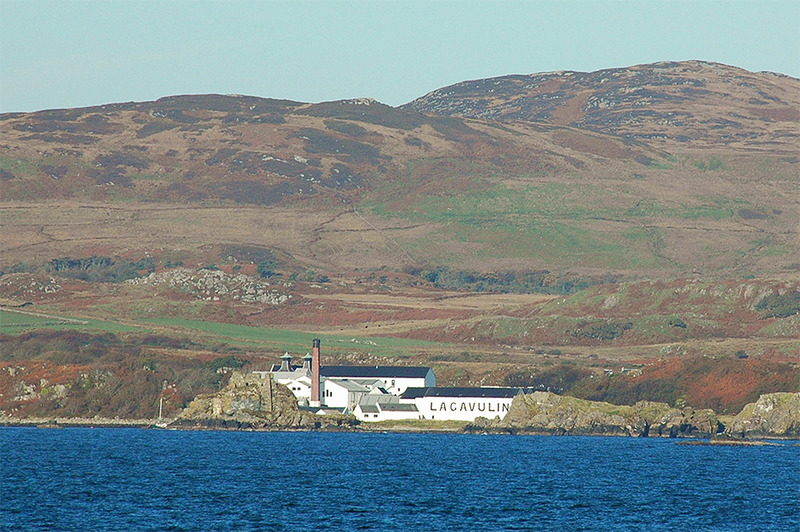 Lagavulin distillery just left of centre, Dunyvaig Castle behind it. Lagavulin Bay stretching almost all the way to the right, notice the waves breaking on the treacherous rocks protecting the bay. A panoramic view over Lagavulin Bay on the south coast of Islay. The island of Texa on the left. The ruins of Dunyvaig Castle guarding the entrance to Lagavulin Bay. Lagavulin distillery on the right. Taken in June 2007.